ArcGIS for Server aids in the integration of the isolated datasets used by different departments. The GIS portal supports and enhances DOT daily business. 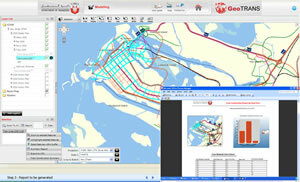 The project is an excellent example of a fast track implementation of an enterprise GIS system for transportation. Here, the GeoTRANS web viewer shows the proposed construction length of selected tramlines for each year. On the coast of the Arabian Gulf rests one of the fastest and most modern growing cities in the world, Abu Dhabi. The Emirate of Abu Dhabi has witnessed a huge growth in infrastructure and construction projects in recent years, such as the famous mega projects of developing the Yas and Saadiyat Islands into tourist and travel destinations. The Department of Transport (DOT) is the organization in the Abu Dhabi government that is responsible for delivering an effective transportation system that contributes to the economic growth, quality of life, and environmental sustainability of the fast-growing Emirate. DOT's authority is to regulate, plan, and develop an efficient and well-integrated transportation system that serves the public interest by enhancing mobility with safe, secure, and environmentally responsible aviation, maritime, public transport, and highways sectors. As part of the Abu Dhabi 2030 vision (the country's infrastructure plan), DOT needed to acquire, build, and implement the best GIS technology possible. Because Abu Dhabi's DOT is a fairly young organization, GIS has only recently been adopted. DOT realized that a robust GIS system was required to support the planning, daily operational and business needs of building, managing, and maintaining a state-of-the-art transportation network, as well as new public transport services. DOT conducted an in-depth evaluation of the different GIS technologies before deciding on Esri's ArcGIS for Server and Geocortex Essentials technology. Based on the ArcGIS platform, Geocortex provides flexible core elements as well as out-of-the-box tools, processes, and features that would give DOT the ability to build and maintain an evolving web-based mapping solution. The project was awarded to GISTEC, the Esri distributor for the United Arab Emirates (UAE), in cooperation with GeoSolveIT, a United Kingdom company that is expert in building transportation GIS solutions. Build the foundation transportation data model, infrastructure, and database for the GIS System within DOT. Use GIS data for planning, design, construction, operations, maintenance processes. Build a public Internet portal (DARB) to deliver services, such as driving directions, bus route information, and road works information. Explore the capabilities to provide GIS services and data to Abu Dhabi government organizations via Abu Dhabi Spatial Data Initiative (AD-SDI). Identify the enterprise GIS roadmap for DOT, which would focus on building the platform to create and integrate GIS applications with other DOT business systems, such as No-Objection Certificate (NOC), transportation impact studies (TIS), road works, and permits. Build GeoTRANS, an enterprise-level intranet portal that would provide accurate and reliable geospatial information and services to various DOT sectors, such as surface transport, aviation, and maritime. 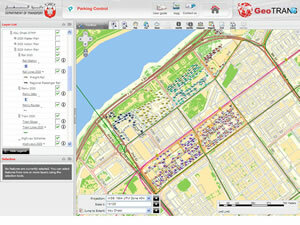 The GeoTRANS web viewer displays all the different parking types, such as premium and standard, within Abu Dhabi city. In July 2010, the GeoTRANS system was launched on the DOT intranet to supporting all the organization's sectors and included an interface to the AD-SDI. The GIS was used to integrate the isolated datasets of different departments into a single geodatabase that encompasses Surface Transport Master Plan (STMP) data; the complete, emirate-wide road network; and information on parking, TIS, and accidents. Today, the GeoTRANS GIS portal is supporting and enhancing DOT's daily business in terms of planning, network operation, public awareness of road works projects, and much more. This project is an excellent example of fast-track implementation of a successful enterprise GIS for transportation in a place with the highest demands in terms of functionality and workflows due to the rapidly growing infrastructure in Abu Dhabi Emirate. This application disseminates key information on DOT's 2030 Surface Transport Master Plan, a long-term conceptual transportation infrastructure strategy outlined for Abu Dhabi. A website contains information on the master plan and the respective five-year action plans (2015, 2020, and 2025). The site shows the planned conceptual locations for the metro, tram, rail, highway, park and ride, and ferry services. The website will be regularly maintained to show the STMP updates. The website also has basemap layers and various useful and frequently referenced datasets, such as imagery and other basemap datasets (i.e., highway routes). This application currently contains road safety data, including summary information about accident hot spots. This is used to support engineers in visual analysis of the summary accident data. Routes and driving directions are displayed based on user choice of start and destination options. This application provides users with information about parking locations and assets both on- and off-street, including the DOT managed parking facilities. The TIS application disseminates information concerning traffic count surveys. The site shows the location of proposals and the remediation/mitigation measures associated with a specific traffic study area. The application also has basemap layers and other useful and frequently referenced datasets, such as imagery and utilities, to support the highway engineers. This application provides rich information about existing bus routes and bus stops as well as taxi facilities, including lay-by and stand locations. It allows users to analyze and manage data with respect to other activities in DOT and reflect the same on the public portal site for public use and dissemination. While GeoTRANS provided advanced tools and functionalities for the DOT's internal end users to access maps, tools, analytics, and reports, DOT envisioned its public portal, DARB (www.darb.ae), as the main gateway to share maps and services with citizens in the United Arab Emirates, using a fast and a simple map-based interface. All the services were planned and implemented in English as well as Arabic languages to cater to both the local culture and also the diversified expatriate community of the UAE. Some of the main services that have been launched for the public are car travel, bus travel, aviation, maritime, and the DARBI (Geofeedback) applications. With the DARB public viewer, citizens can see the parking areas in Abu Dhabi City with parking rates and time allowed. There is a wide range of services offered to the public in this application. It can help users find driving directions and parking areas, understand future parking plans, and locate road work and detours. The Bus Travel application can help users find bus routes within Abu Dhabi City, Al Ain, and Western Region, as well as intercity bus services. Users can find the map displaying the complete bus route based on the origin and the destination options specified. Additionally, they can also discover the points of interest that are along the selected bus route. Many services are offered to the public in the Aviation application. It can help users find locations of and driving directions to airports and obtain parking and airport terminal information. Public users can use the map in this innovative feature in the DARB portal to record any incidents pertaining to road asset, parking, bus shelter, street lighting, and road conditions. Users can click on the map and choose the type of the incident to be reported, enter all the required information about the incident, and even upload photos. Incident reports are sent to DOT's Customer Care department for further action. Once the issue is addressed by DOT, the user receives an e-mail with a link to open the Geofeedback map directly in DARB and see the status of the incident report. For more information, contact Saed Abu Helwa, GISTEC (e-mail: Saed.abuhelwa@gistec.com).